Rosie’s boyfriend dumps her and then is seen all over town with his “skank” of a new girlfriend. Rosie doesn’t take this well and in a moment of impulsivity ends setting his car on fire. Her ex-boyfriend then files a temporary restraining order against her and her parents force her on a summer road trip to get away from the situation. Rosie sets off with the boy next door, who has been her friend forever, and the boy next doors best friend and older brother. 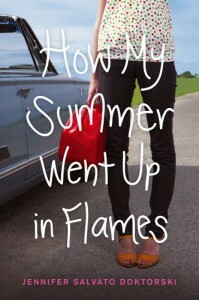 I really like road trip books and How My Summer Went Up in Flames was no exception! The camaraderie between characters was my favorite thing about this book. After Rosie gets over her initial shock and frustration about being on the road trip she settles in with the boys and we get to know each of them in turn. At first Rosie got on my nerves she was very selfish and wouldn’t let go of her relationship with her ex. I really wanted to play on a loop “He’s just not that in to you”. Luckily as the novel progressed and she put some distance between her and the ex Rosie got a lot better. It was the boys Rosie was on the road trip with that really stood out to me. I loved her relationship with Matty, who had been close with her family since forever. He was a great foil to Rosie who was rash and impulsive he was calculating and dependable. I also liked Matty’s best friend Spencer who was a totally likable dork. That brings us to Logan who is the reason this road trip is happening in the first place, he was a funny leader, even though I don’t think he ever intended to be funny. I also liked the little relationship that developed between him and Rosie it was sweet and I liked how grown up Rosie was about it. 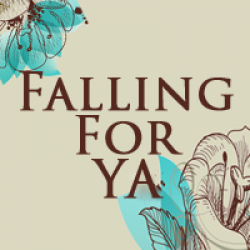 Overall, How My Summer Went Up in Flames was a very cute beachy read, I really enjoyed Rosies’ character transformation and look forward to reading more from this author in the future.